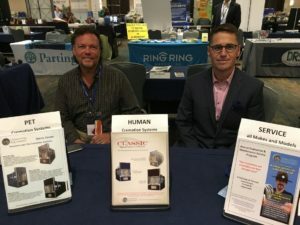 During the week of July the 8th, U.S. Cremation Equipment attended the Cremation Association of North America (CANA) annual conference in Ft. Lauderdale, Florida. This is considered the largest Expo for the cremation industry in the US. Nathan Blackstock, Brian Gamage and Luis Llorens were present during the event. In addition, the cremation statistics for the previous year were presented and it was interesting to hear that our state (Florida) reached a 64.9% cremation rate. The percentage of cremation nation-wide continuous to increase and according to CANA it currently stands at 50.3%. Thanks to everybody who stop by our booth during the show. It was great to see old friends and customers alike.